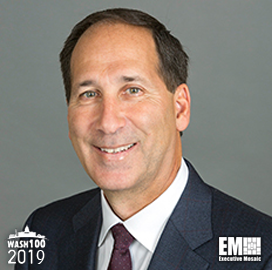 Executive Mosaic is pleased to announce Al Whitmore, president of the intelligence and security sector for BAE Systems’ U.S. arm, as an inductee into the 2019 edition of Wash100 — Executive Mosaic’s annual selection of the most influential voices in the government contracting arena — for leading BAE to major contracts in R&D, the cloud and other emerging technologies. This marks Whitmore’s second consecutive Wash100 award. Whitmore oversees a segment of BAE Systems with about 7,000 employees in the U.S. and abroad and provides a range of services such as cybersecurity, information technology support, intelligence analysis, operations and maintenance and systems integration support. BAE is one of the 15 companies that secured a spot on the $28B Information Analysis Center Multi-Award Contract with the Department of Defense in August 2018. Whitmore said the contract provides BAE the opportunity to leverage internal research and development to address mission challenges. “We are excited to help the government leverage innovations in artificial intelligence, machine learning and directed energy technologies to enhance the security and effectiveness of our warfighters across physical and digital domains,” Whitmore said. Aside from the IAC MAC vehicle, BAE’s U.S. subsidiary won a three-year contract in February to continue assisting the U.S. Air Force address obsolescence on aircraft, weapon systems, equipment and electronic components through the firm’s web-based Advanced Component Obsolescence Management platform. Al Whitmore joined BAE in October 2017 from General Dynamics’ information technology business, where he served as senior vice president of the global solutions division. Before General Dynamics acquired GTE Government Systems, he held senior leadership roles with the company for almost 15 years. Executive Mosaic congratulates Al Whitmore and his BAE team for receiving this Wash100 award.